This month at Pasture Living, we're doing a series on "I Care for Our Planet!" in conjunction with us being nominated as a finalist in the "eco challenge" category of the Singapore Blog Award 2013. 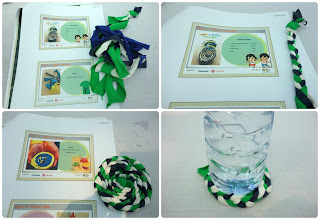 I had an opportunity to attend the eco craft workshop organized by Panasonic and omy.sg at Singapore's first eco-mall, City Square Mall. I learned a few new things about Singapore's movement towards green living and I'm proud to be a part of it. What did we do in the eco craft workshop? The theme was "Reduce, Reuse, Recycle." 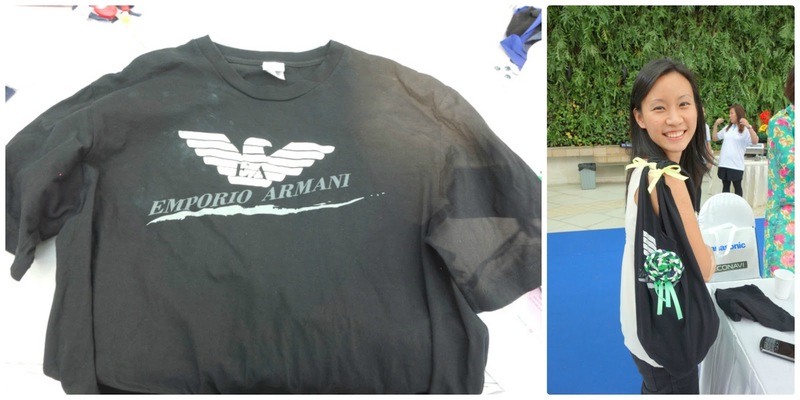 So we made a few eco-friendly activities that used something old and turned them into something new. 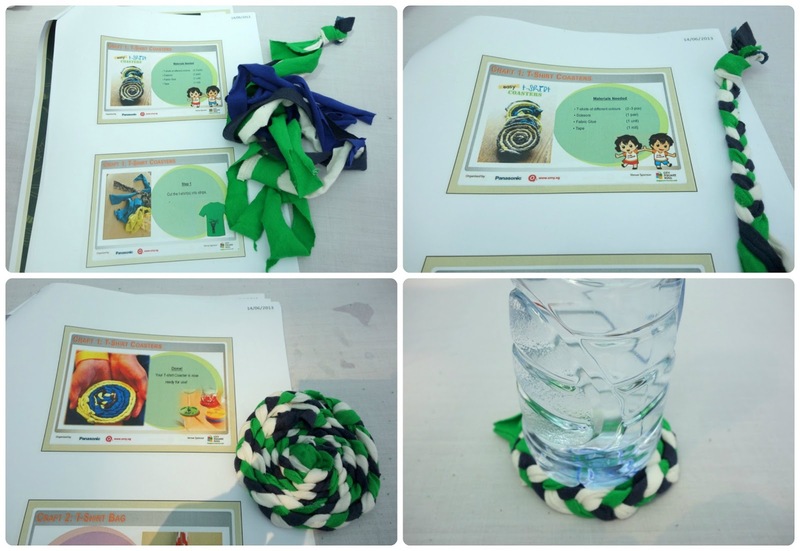 Simple activities that you can do with your children while teaching them to reuse and recycle. 1. Handmade Coasters. We used old t-shirts, cut them into long strips, braided three long strips, and glued them into a circle. Using old t-shirts to make coasters are very good because cotton absorbs water well. You can use this "coaster" in various ways. Put it on greeting cards, make it into a headband, or pin it into a bag (like I did, see picture below). 2. Handmade Bags. We used old t-shirts, cut the neckline, sleeves, and bottom hem. 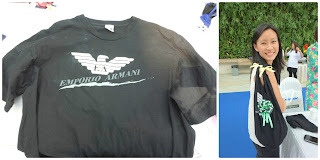 Turn the t-shirt wrong side up, tie the bottom of the shirt with the hem that you cut earlier, turn the t-shirt upside up, and you have made a handbag! Decorate the bag as you wish. I used my "coaster" and made a lollipop design. 3. Handmade Stationery Pouches. We used unused socks, cut two slits on the top, and put a ribbon through. Decorate as you like. I made some nice friends there and it was a refreshing experience to meet fellow bloggers. Each of the bloggers were interviewed about how we felt being the finalists of the eco challenge category of the Singapore Blog Awards 2013 (pleasantly surprised and honored, of course!) and I was asked how I view green-living in my personal life. And I answered how I read a story about a mom who made a beautiful dress for her little girl, how initially that dress was only worn for special occasions, how as she grew taller, layers of fabrics were added to extend its life, how then it became a top when it no longer fit as a dress, how then it became an apron, and then a dusting cloth, and then became cloths to clean the floor. Nothing about that dress was wasted and she used that dress until it was no longer usable. This story is so powerful in reminding me about being a good steward of things and I hope I can find ways to do the same. Each of us was given a goodie bag and among the gifts was a bamboo towel. It's the softest towel I've seen! It's so fascinating I decided to write about it in a separate post. At the end of the workshop, we were given a small tour of the mall to learn about the mall's green features. 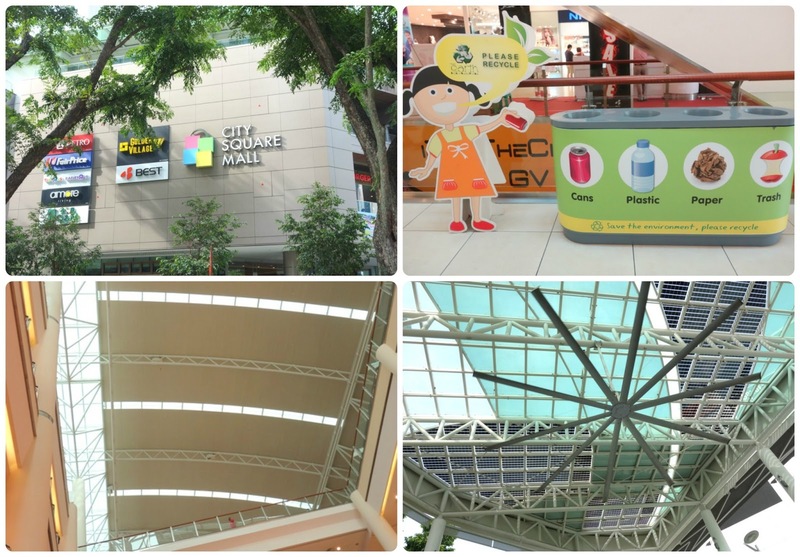 What Makes City Square Mall Eco-Friendly? 1. The mall uses panels that allow natural lights to shine through, thus requiring less electricity during the day. 2. Lighting sensors are installed in the mall that detect how much natural lights pass through and it will manage on its own how much extra lights it needs to turn on or off based on the level of brightness they detect (auto-lighting). 3. The escalators save energy by slowing down when its not in use. 4. You can find recycling bins in the mall. 5. In their outdoor fountain area, which is also covered by glass panels that allows natural light to pass through, has a green wall that is made of fern plants which acts as a beautiful backdrop and provides a cooling effect. They made the system such that it stores rain water to water the plants, instead of using clean water. And I found out from its websites, there are more green features that make this mall eco-friendly. You can read more about it here. Yay for a greener Singapore! The towel is indeed very soft. I like it! I wish they gave a bigger one! I Care for Our Planet!